My son, Logan, is "crashing into Kindergarten" in about a week. He is crazy excited. I am crazy nervous. Generally he loves meeting new people and trying new things. He is very ready for kindergarten, yet I can see a difference in his behavior, which usually shows he is a little nervous. He gets a little hyped up and jittery! Children will vary in their responses to attending school. Some children are probably ready to go, but many will be very nervous about starting school. 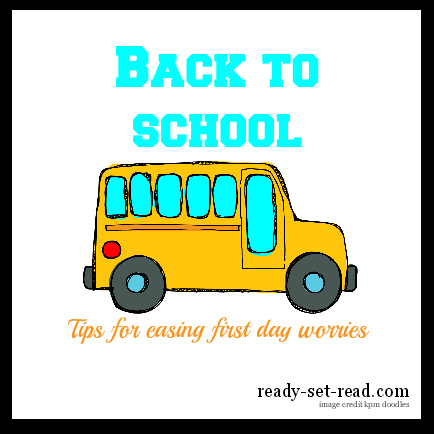 There are many literacy activities that you can incorporate into your day that will help ease the worries of back to school. It can be helpful to read books about school or write about school experiences. These back to school prep times can be fun and hands on! I'm sharing lots of back to school ideas today. 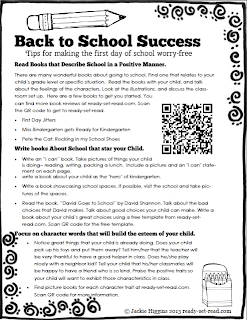 I've even rounded up some of these tips into a one page handout for parents that teachers can print and pass out at open house. In fact, I'll have helpful handouts every day this week that would be great to pass out at open house. Make sure you stop by tomorrow for the details. Read books that describe school in a positive manner. One of Logan's favorite back to school books that we've been reading almost every night is the popular, Miss Bindergarten Gets Ready for Kindergarten . In this story, the book follows a class of animals as they prepare for the first day of kindergarten. Interspersed between the pages of children getting ready, the book shows how the teacher is preparing the classroom. Logan loves to talk about what the teacher is doing. "She's sorting the blocks." As well as what he may have in his classroom, "I wonder if we'll have blocks. I thought that was just for preschool. Do you think they'll have blocks in kindergarten too?" The book has helped him express his feelings, his questions, his worries. 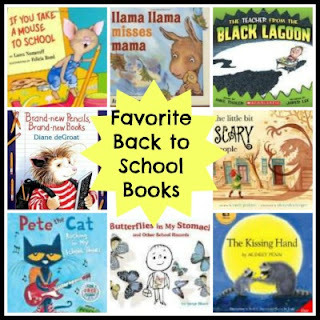 Check out our favorite back to school books. Find one that your child loves or explore a new one every day to countdown to school. Write books about school starring your child. Last year, one of Logan's favorite school books was David Goes To School by David Shannon . 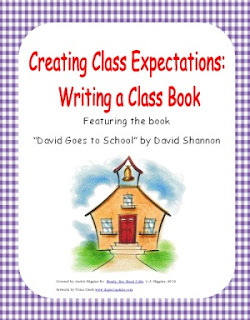 While I love David Shannon's books, and adore little naughty David, I wanted a more positive spin on the beginning of the school year. I decided to write a "Yes, Logan" book. We focused on positive classroom behaviors. On each page, he wrote his name and drew a picture of something positive he could do at school. For instance, he can wait his turn in line. He then wrote his name on the line so that the text would read, "Yes, Logan!" You can find the free template and instructions for use on my David goes to School post. Other ideas for putting a positive spin on back to school writing experiences. write an I can book. Take pictures of things your child is doing-- reading, writing, packing a lunch. Include a picture and an "I can" statement on each page. write a book about your child as the "hero" of kindergarten. Logan is really into super heroes this year, so we are going to give this a try. make a book about school spaces. I love this post on Easing Kindergarten Anxiety by Coffee Cups and Crayons. She explains how to tour the school and make a personalized book for your child featuring her school! Focus on character words that will build the esteem of the child. Notice great things that your child is already doing. Does your child pick up his toys and put them away? Tell him that his teacher will be very thankful to have a good helper in class. Does he play nicely with a neighbor kid? Tell him that his classmates will be happy to have a friend who is so kind. Praise the positive traits so your child will want to exhibit those characteristics in class. A great book to use when talking about positive character traits is Courage by Bernard Waber . Courage is a characteristic your child will need when heading off to school, especially if it is a new school or new class. In this book, Waber shows big and small acts of courage with engaging illustrations and simple text. Children are able to see police and fire fighters that show courage as well as children who show courage. There are tangible acts, like diving off a diving board, internal acts, like being the first to make up after an argument, silly acts, like eating vegetables without making a face, and emotionally challenging acts, like sometimes having to say goodbye. After reading the book courage, talk with your child about courageous acts they can show at school. Courage is being the first to introduce yourself to a new friend. Courage is asking a teacher for help. Here are picture books featuring character traits your child will need as they head back to school. 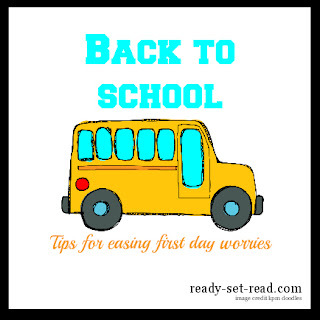 If you found the ideas in this post helpful and would like to share them with parents, I have provided a one page handout giving some of the basic information about easing first day worries. This would be a great handout to provide to parents at open house. There is a QR code provided on the handout. Parents seeking additional information can scan the code and find this blog post. I adore the idea of a Yes book!!! Great ideas! Thanks again for sharing it on the KBN Back-to-School blog hop! Awesome ideas! Welcome to Kindergarten, Logan! Is he going to a public school? He is going to public school. I am happy with the school district where we live but it feels so much different the private preschool he attended. I guess it's just the next step in the journey.